The Ontario Auditor General released her 2018 annual report on December 5. Many topics were examined by the AG, but two related to Metrolinx bear examination by anyone concerned with the future of transit planning and management with more responsibility shifting to the provincial level. The Auditor General appeared on Metro Morning on December 6 speaking about, among other things, the cost of policy changes regarding LRT lines, and the evaluation of potential stations. Former Minister of Transportation, Steven Del Duca, wrote an opinion piece in the Toronto Star claiming “I wasn’t meddling, I was building transit”. This is rich considering the effort Metrolinx went to in revising its evaluation of new stations. Del Duca was notorious during his Ministry as using Metrolinx as an unending source of profile-building photo ops. He uses the Relief Line as an example of his intervention to get the project going despite early reluctance at the City and TTC level. This is a convenient rewriting of history and, in particular, of the huge difference between an RL ending at Danforth, and the one later evaluated by Metrolinx running north to Sheppard. The RL became popular and scored well once its extent and projected demand produced a significant dent on the Yonge line so that the Richmond Hill subway might be feasible. Although the Metrolinx Board meets in public from time to time, the legislation governing this body allows most issues to be debated and decided in private. There is no reason that this will change for the better. The chronologies set out by the Auditor General reveal situations where the Board was advised privately as issues evolved and met publicly only for the formality and patina of respectability conferred by their “approval” of matters already decided. What is unclear is whether the Board actively participated in directions to staff that would lead to the rewriting of reports and recommendations, or merely chose to avert their eyes from the mechanics of political sausage making. In any event, the process detailed by the AG throws into question everything that Metrolinx has done. Can anyone trust an organization whose professional opinion is so pliable, and which will defend recommendations, threadbare though they may be, so strongly? This is not just an issue for Metrolinx but for many public agencies involved in transportation planning notably the City of Toronto and the TTC. To its credit, Metrolinx is developing a standard methodology for Business Case Analysis and will publish this in April 2019. However, the problem remains of just how well this will protect against hidden interference from politicians and their friends. For many years, Metrolinx has used a methodology to evaluate projects that purports to establish the worth of a scheme, which could be negative, such as a new transit line or a significant change to existing facilities. The framework includes multiple factors examining projects from different points of view. The Economic and Financial Cases review a proposal from two different monetary viewpoints. The Economic Case measures benefits such as auto operating cost savings, reduced emissions and air pollution, travel time savings, health benefits and reduction of accidents. The Financial Case looks at the cost and revenue estimates to produce a net operating cost as well as a “net financial impact” stating the total revenue over the study period minus the capital and operating costs. The Deliverability and Operations Case concerns the implementation plan, procurement, operations, maintenance and risk management. These factors overlap and the calculation machinery includes many assumptions such as future population and employment patterns, fare structures, operating and capital costs, trip diversion rates to transit, and the value of various benefits both to transit riders and society in general. Many of these are not published at a level of detail that would permit an outsider to understand how each factor behaves, and there is considerable leeway to affect the outcome by “twirling the dials” on factors readers cannot easily review. A big issue with these analyses has been the question of how benefits are valued. For example, if a new transit service attracts people out of their cars, then this reduces the operating cost of those vehicles and produces environmental benefits, but it can also reduce travel time both for new riders and those on existing services. The values assigned to these and other benefits do not accrue to Metrolinx, but to the wider population. These savings, whether they be tangible (lower driving costs) or intangible (the value of time saved) are used to offset the hard costs of actually building and operating a service. While there may be an overall balance, the savings do not pay the bills which must rely on future revenue and subsidy. A major contribution on the “benefit” side of the analysis is almost always the travel time savings for riders. For example, in the recent GO Expansion BCA, this is the overwhelming contribution to “value” in the analysis. Any factor that increases travel speed affects this measure, and in the case of stations “less is more” is the rule. Fewer stations make for faster trips and that translates to a higher modelled benefit. This has been at the heart of Metrolinx analyses for years and drives a pressure for wider station spacing even on urban lines like the Crosstown project. Adding a station to any route triggers a requirement to find an offset elsewhere such as a stimulus to riding that will drive up total rides even if they are all a bit slower. A further problem with Metrolinx analyses is that the time period for comparison of costs and effects has grown to a 60-year horizon with the effect that far-distant benefits are shown as potentially offsetting short to medium term costs. This requires assumptions about the future of the transit system, the economy and regional development far beyond a period where anyone can reasonably know what will happen. In an effort to temper this, Metrolinx performs sensitivity analyses by changing factors to see what the effect would be. For example, if a more conservative set of assumptions goes into the model, what happens to the benefits, or does the proposal even fall into negative territory? How “successful” does Metrolinx and the region have to be in order to achieve its goals? Needless to say, with such a timeframe, most of the readers, let alone authors, of these studies will be long gone before we could challenge their long term validity. The more subtle problem is that showing such long term benefits tends to paper over the fact that in the short to medium term, new facilities (particularly those requiring large capital investments) will not achieve anything near profitability and this shortfall must be financed. I will turn to this in more detail in a review of the Metrolinx GO Expansion BCA in a future article. Updated April 15, 2018 at 6:00 pm: Comments about projected demand at Park Lawn Station have been added at the end of this article. In a previous article, I reviewed the Metrolinx technical report on the performance of proposed new GO and SmartTrack stations as part of their overall network. At the time, there was some debate about the validity of the report’s analysis. Metrolinx has now produced a backgrounder to this report which gives greater details about their methodology and results. 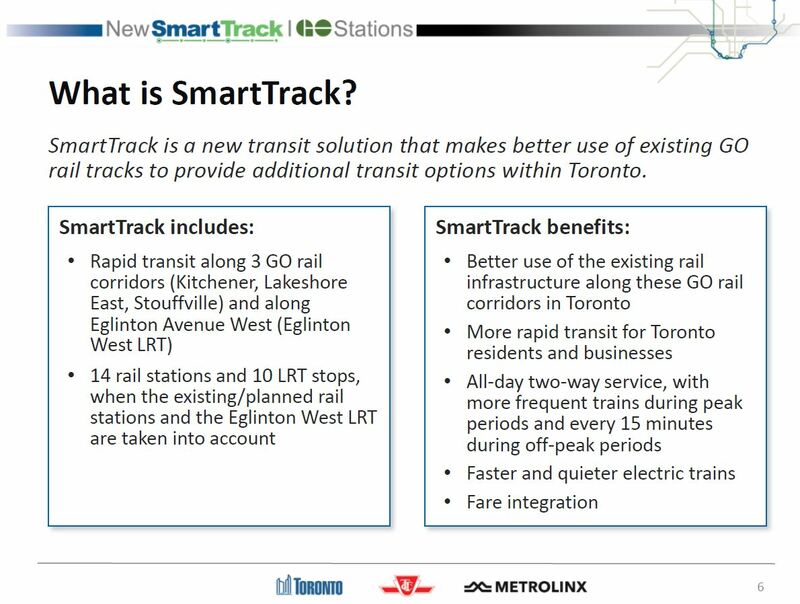 This information is interesting not just in its own right as part of GO’s planning, but also in its implications for the City of Toronto’s expectations for GO/SmartTrack service. The service levels listed in the City’s report date from a Metrolinx plan approved by their board in June 2016. The levels shown in the backgrounder are different, and reflect the change to a mix of local and express trains in the GO corridors. The backgrounder takes pains to emphasize that the service plan is not definitive, but the express/local mix of trains is an essential part of GO’s strategy as approved at a recent Board meeting. The degree to which riders are lost from GO because the addition of stops reduces the competitiveness of GO travel versus driving. The degree to which riders shift to a new station thereby reducing their travel time. The number of new riders who previously drove and are enticed onto transit by the new station. This scheme underpins recent changes in the planning for services notably through the benefits conferred by a combination of express services (avoided delays from new stations) and level boarding (reduced station dwell times generally). The technical details of “level boarding” have yet to be revealed, but the analysis assumes a benefit through the elimination of the step between platforms and the interior of trains. The benefits of electrification in reducing overall travel times and allowing for more closely spaced stops are not mentioned at all, and travel time comparisons are based on an electrified service as a starting point. Metrolinx has effectively discarded one of the arguments they used in advocating electrification in the first place. The recently-announced Ontario Budget includes a lot of spending on transportation that transit riders in the GTHA can only hope to see delivered by whoever is in charge at Queen’s Park after the June 2018 election. Even though the budget is as much about vote-getting as about actual governance, it is worth looking at what the promised fare changes would bring if they are implemented. As with any announcement, “the devil is in the details”, and I fired off a series of questions to clarify how this might all work. Responses came back from Metrolinx. Q1: Regular GO Transit riders now enjoy a monthly cap of 40 fares on their travel. The 36-40th trips are at a discount, and from 41 onward, they are free. Will this apply to the new $3 fare? In other words, is there an upper limit of 40 x $3 = $120 to a rider’s cost of using GO within the 416, or is it open ended like TTC fares where there is no cap unless one buys a pass? A: Details on this will be worked out as part of our implementation planning and work. Q2: There are now co-fare arrangements between the 905 systems and GO, as well as between GO and TTC. If someone makes, for example, a YRT-GO-TTC trip, what discounts apply? Are the cofares cumulative? A: YRT-GO Co-Fare, GO-TTC DDF. Yes, cumulative. Q3: By analogy to Q1, if a rider makes a three-legged trip regularly, thereby becoming entitled to free rides for the GO segment after 40 trips, what happens to the co-fares? Do they still apply, or does the rider pay full 905 plus TTC fare in this case? The potential savings are “up to $720 per year”. Is this simply a calculation based on 20 commutes for 12 months, or will it be a capped saving? A: Details on this will be worked out as part of implementation planning and work. Q4: If someone has a Metropass (or its Presto equivalent), they are not entitled to the TTC-GO co-fare. Is it correct to say that their monthly cost would be the cost of the pass plus $3 times the number of GO trips taken within Toronto? Q5: For clarity, is the $3 fare a flat rate even if riders transfer from one GO service to another, such as from Lake Shore to UPX, but stays within Toronto for their trip? A: Yes as long as [the] individual uses the GO readers for their UP Express trip. Q5a: If part of their trip is inside Toronto, but a second leg goes outside, does the $3 apply to the “inside Toronto” portion? Example: Rough Hill to Union to Weston is all inside Toronto, but Rouge Hill to Union to Airport is not. A: Fares for any trips to and from Toronto Pearson Airport remain unchanged. Q6: The co-fare for GO-TTC is relative to an assumed $1.50 per full adult fare with lower co-fares for those getting discounts like Seniors. Will the same apply to the 905-416 co-fare? A: Details on this will be worked out in conjunction with the transit agencies. In brief, the only thing that is nailed down so far is that discounts between each leg of a trip are cumulative so that, for example, a Miway rider travelling to a station within the $3 GO tariff zone and thence to a TTC route will get the Miway co-fare discount, the new low GO transit fare and the GO-TTC discount. Also, transfers between GO services do not attract another fare provided that the trip stays within the city. Every thing else is to be “worked out”. Leaving aside the question of whether the government in place for the 2019-20 budget will support whatever fare scheme Metrolinx comes up with, there are also obvious questions about the implications for service crowding and for possible changes needed in local route networks, mainly on the TTC, to provide better connections with GO stations. The lower fares may look attractive, but actually using the service could be challenging within Toronto. On Lakeshore West, most inbound trains run express from Clarkson to Union with local trains only every half hour in the AM peak. The same arrangement applies outbound on the PM peak. On Lakeshore East, there is a similar pattern with express trains skipping all stops from Rouge Hill to Union, and local trains running roughly twice/hour in the peak, albeit on an irregular headway. Some additional service is provided at Danforth (Main) and Scarborough stations by the Stouffville line’s trains. TTC services in southern Etobicoke and Scarborough focus on the Bloor-Danforth subway, and actually reaching the GO stations (or using the TTC as a connecting service from them) is not easy. On the Milton corridor, trains operate only in the peak period, peak direction although for someone at Kipling Station, the all-local service now operated would actually be better than what is provided at, say, Mimico on the Lakeshore West corridor. The Barrie corridor and the Vaughan subway extension are in direct competition with each other, although service is far more frequent, especially during the off-peak, on the subway than on the hourly GO train, and the GO stations within Toronto are not well-served by the TTC network (other than the connection point at Downsview Park station). The Richmond Hill corridor, like Milton, has only peak service, and its stations within Toronto are poorly served by the TTC. The Stouffville corridor has all-day service with stations that potentially could connect with TTC feeder routes at Steeles (Milliken), Sheppard (Agincourt) and Eglinton (Kennedy). As on Lakeshore, the tradeoff will be for a faster trip bypassing the subway. The Weston corridor is a special case because it hosts not only the GO Kitchener service but also the Union Pearson Express (UPX) trains which provide the most frequent of GO services within Toronto. The fare reductions for trips from the near-Toronto stations in the 905 could shift some travel away from the subway, although few of the stations are well-located for this purpose. The Richmond Hill corridor is the most obvious of these, but the limited service there does not offer a lot to diverting demand. As a follow-up question, I asked Metrolinx whether they had any demand studies to show travel patterns with the new fares, to the degree that these are known. Their reply is pending, and I will update this article when I receive further info. It is well-known that the demand models are sensitive to three factors: trip speed, service frequency and fare level. This came out quite clearly in the background studies for SmartTrack and the Scarborough Subway where ST would succeed in drawing significant riding only if it operated frequently and cheaply, as originally touted in John Tory’s campaign. Just how many riders the lower GO fares, by themselves, will attract remains to be seen. A related problem, of course, is the question of train capacity if many actually shift to GO. Not to be forgotten in all of this are the cross-border travellers between the 905 and 416 (in both directions) for whom a discounted fare will be a benefit. However, if this is only available to riders paying the full adult fare in each jurisdiction, this could undo the benefit now enjoyed by pass users who will not get any further discount. This would be particularly important if a pass holder took many “local” trips on the TTC in addition to cross-border trips into the 905. In general, riders who already enjoy some sort of discount like seniors and students will benefit far less from the new tariff. Whether any of this will come to pass is purely speculative at this point given the tenuous status of the current government and the well-known, vague bluster of their principal opposition. Metrolinx (and by implication its political masters) have wasted years on pursuit of “fare integration” schemes that began with the premise of revenue neutrality to limit the government’s cost through added subsidies, and with the underlying view that distance-based fares were the end state at which they would aim. Had the option of added subsidy and reduction of short-haul GO fares been part of the mix a few years ago, the entire debate over fare integration could have taken a completely different path and a new tariff would already be in place. Transit policy should arise from reasoned, open evaluation of alternatives, including those that may require an “investment” to make them work, not from a deathbed change of heart by an unpopular government facing defeat at the polls. The reports did not include any illustrations of the proposed designs, but these are starting to appear through the SmartTrack station consultation meetings. As they become available, I will post excerpts in this article. The March 1 meeting dealt with four stations on the west side of the old City of Toronto. The presentation materials are not yet online, but I have included excerpts from them here. Noise during the construction period, and later from trains including the bells which sound as they enter and leave stations. The service plan – what will be the frequency of service through and at each station? Fare integration – what will the fare be for a combined TTC/GO trip? A Metrolinx representative was somewhat evasive on the issue of noise on two counts. First, there is the question of how long it will be before the majority of service will be electrified. If one believes the original electrification plan (cited by the Metrolinx rep), some trains will always be diesel on some lines because they will run into territory owned by other railways where electrification will not occur. Conversely, if one believes the optimistic claims of the hydrogen train study, all GO trains will convert to hydrogen-electric operation, although on exactly what timetable is unclear. The noise of the bells raises two concerns. First is the question of whether there can be an exemption so that neighbours are not constantly annoyed by the bells of passing trains. The other is the methodology by which an “environmental assessment” treats transient noises like this. Past EAs have dismissed transient noises because they average out with lots of quiet time between trains, but this does not address the problem of occasional noises such as roaring engines or ringing bells. Moreover, with the planned increases in service levels, these noises will be present more frequently. 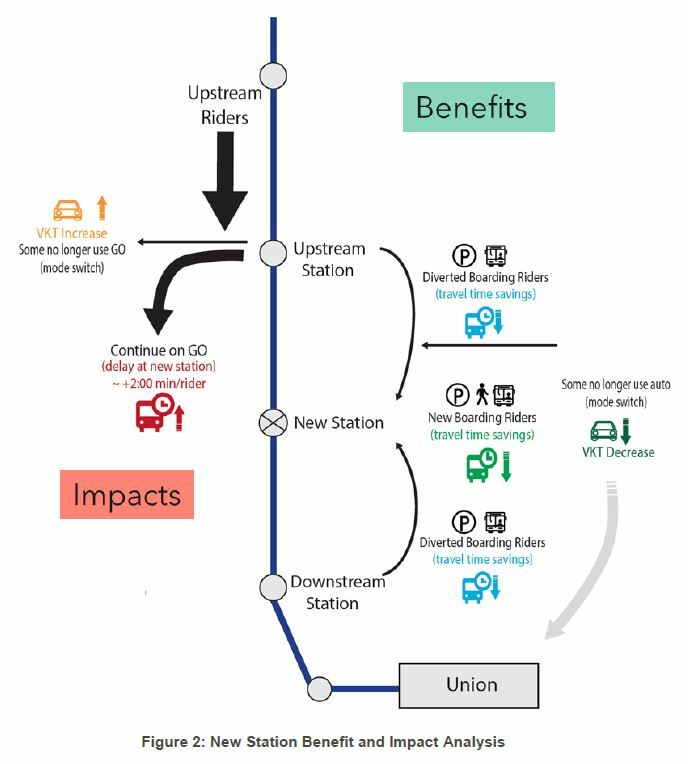 A pressing issue for most stations is the recently revised service plan that Metrolinx announced in its updated stations report. Reduces the number of upstream riders that need to travel through the station. Upstream users that are travelling through may now choose to use a faster express train to reach their destination. This reduces upstream delays and the number of riders that switch to other modes. This will have a positive impact on station performance. Reduced train frequency at stations without express service (i.e. trains that previously stopped at the station can now skip some stations). Riders may also divert to stations with express services resulting in a negative impact on station performance. As the GO RER service plan is still evolving, a conceptual service plan has been developed for modelling purposes only, which considers the following express or tiered inner/outer service concepts on the Lakeshore West, Barrie and Stouffville corridors. Lakeshore West corridor: Alternating trains with bi-directional 15 minutes service on the corridor with stops at Mimico and Park Lawn stations. Mimico and Park Lawn stations would therefore receive 30 minutes service inbound and outbound all day. Barrie corridor: Outer service stopping at all stations between Allandale Waterfront and Aurora; trains will also stop at Downsview Park and Spadina stations, otherwise, express to Union Station. Inner services will serve all stations between Union Station and Aurora. Stouffville corridor: All-stop peak direction outer service between Lincolnville and Unionville stations; trains will also stop at Kennedy and East Harbour stations, otherwise, express to Union Station. “Inner” services will stop at all stations between Unionville and Union Station. This does not match the service plan adopted for RER in June 2016 where all trains would serve all stations, although that appears to be the plan staff at the March 1 meeting were working from. The claim of “all-day two-way service, with more frequent trains during peak periods and every 15 minutes during off-peak periods” can be read to mean quarter-hourly service all day with even better peak service, or it can be read as “better service than you have today” during peak periods, but not necessarily every 15 minutes, let alone 10 minutes or below. As things now stand, the difference between Metrolinx’ updated service plan and the claims of SmartTrack service levels border on misrepresentation.